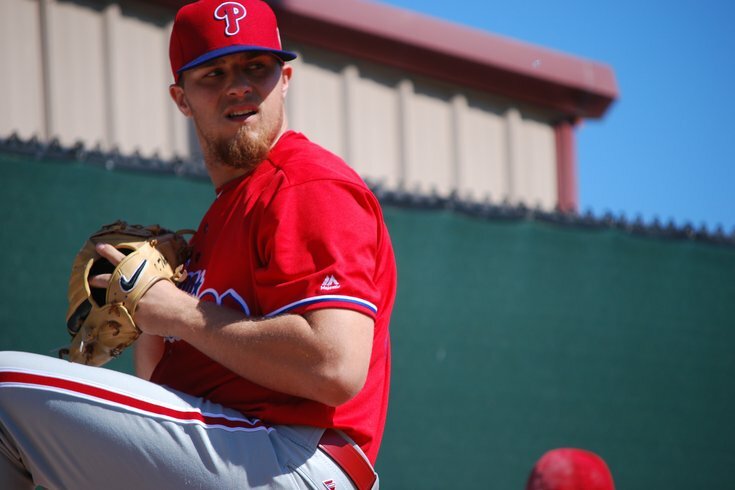 Phillies top pitching prospect Jake Thompson, who has a 1.21 ERA in his last 11 games at Triple-A Lehigh Valley, will make his major league debut in San Diego on Saturday. 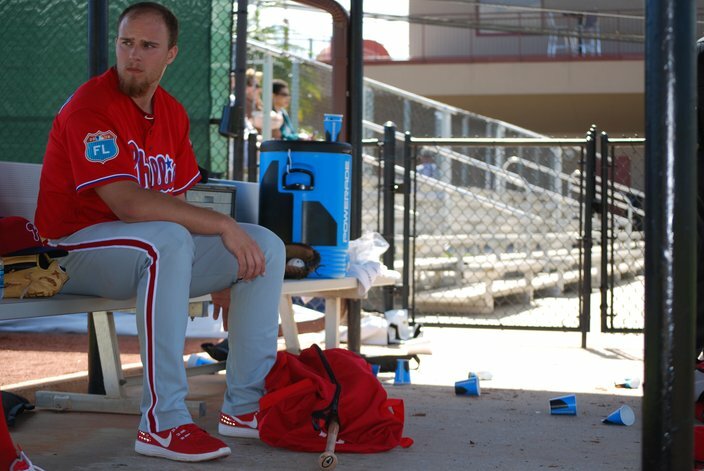 CLEARWATER, Fla. – For a top prospect that only turned 22-years-old a little more than a month ago, Jake Thompson has the rare advantage over many of his fellow, young newcomers into the organization in the last two years: the trade that sent him to Phillies was his second in 373 days. Before being a part of the package that the Texas Rangers sent for Cole Hamels on deadline day last summer, Thompson had been traded from Detroit to Texas in the deal that netted the Tigers veteran reliever Joakim Soria on July 23, 2014. The advantage of being dealt twice as a talented prospect? Perspective. Thompson, who made his Phillies debut on Thursday with two innings of work in a 3-2 loss to the Houston Astros, said he tried to hard to prove his worth when he arrived into the Rangers organization. Thompson faced some trouble against the Astros, but in part because third baseman Taylor Featherston booted a ground ball that would have been the third out of the second inning. In two innings he allowed one unearned run on three hits and a walk. He also painted a nifty slider on the outside corner to strike out the first batter he faced in the second, Astros infielder Matt Duffy. Thompson, rated the second best prospect in the Phillies system behind shortstop J.P. Crawford by MLBPipeline.com, and third, behind Crawford and fellow Hamels trade freight Nick Williams by Baseball Prospectus and Baseball America, showed off a lot upon arrival last summer. The 6-4, 235-pound Texan never allowed more than two runs in a start in five weeks with Double-A Reading. He had a 1.80 ERA in seven games and held Eastern League opponents to a .217 batting average and .273 OBP. Thompson will likely begin the 2016 season at Triple-A and be among the first names the front office considers when a vacancy opens in the big league rotation. Of course, Thompson could create that vacancy by pushing for a promotion with productive games in Lehigh Valley, too. While he admitted he was still in the process “of getting better and growing” as an unfinished product, Thompson was plenty amped up with the opportunity to face major league hitters for the first time in his life on Thursday. Thompson has leaned on veterans like Charlie Morton and Carlos Ruiz during his first few weeks in camp, picking their brain on pitch sequences and arm slots after bullpens and live batting practice sessions. He’s in regular contract with coaches and coordinators as he polishes his overall game. As he said, he's still learning. But when he does arrive to the big leagues, he won’t have to experience any kind of Phillipe Aumont nerves of being the guy traded for a pitcher the caliber of a Cliff Lee or a Cole Hamels. There’s no sense in trying to light up a radar gun or try to strike everyone out to prove anything to anyone. The organization obviously values you highly already if they traded away a World Series MVP to bring you aboard. Nick Williams, one of the other prospects who arrived in the Hamels trade, also made his Grapefruit League debut on Thursday. Williams played all nine innings in right field against the Astros and went 1-for-3 with two walks. The 22-year-old Williams was held out of action earlier this week while battling a fever and a sinus infection. “It was great just to see a big league arm for the first time,” said Williams, who worked a four-pitch walk against Houston’s Doug Fister in his first at-bat.